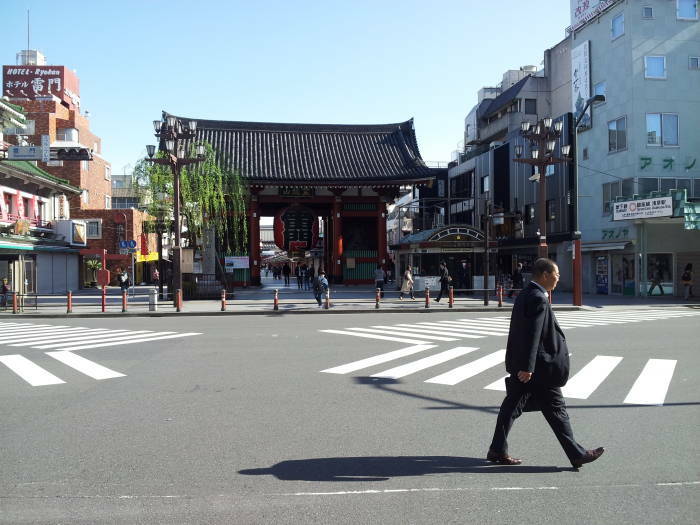 I have just arrived in Asakusa, found a place to stay, and I am on my way to Sensō-ji, a Buddhist temple that is the most-visited religious site in Japan. 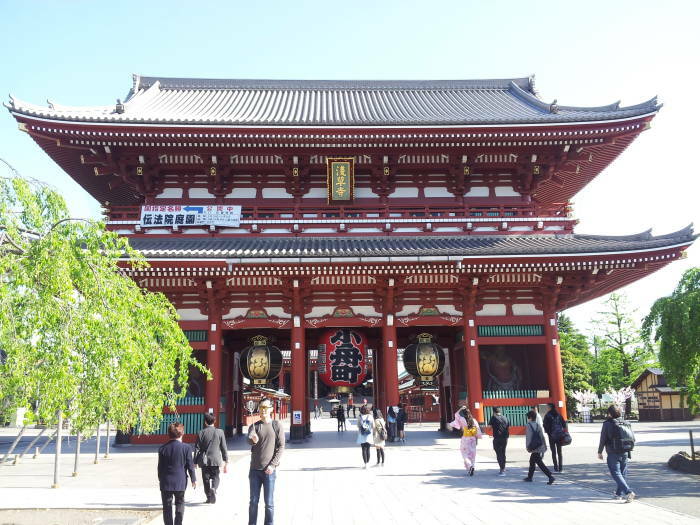 Kaminari-mon or the Thunder Gate is the great outer gate of the Sensō-ji complex. The terms -mon means "gate" and -ji means (Buddhist) "temple", so you might say that this is the Kaminari gate of the Sensō temple. Japanese orthography doesn't indicate word breaks, let alone hyphenation, so Kamanarimon, and Kaminari-mon, and Kaminari mon are all equivalent. However you write it, this is it! 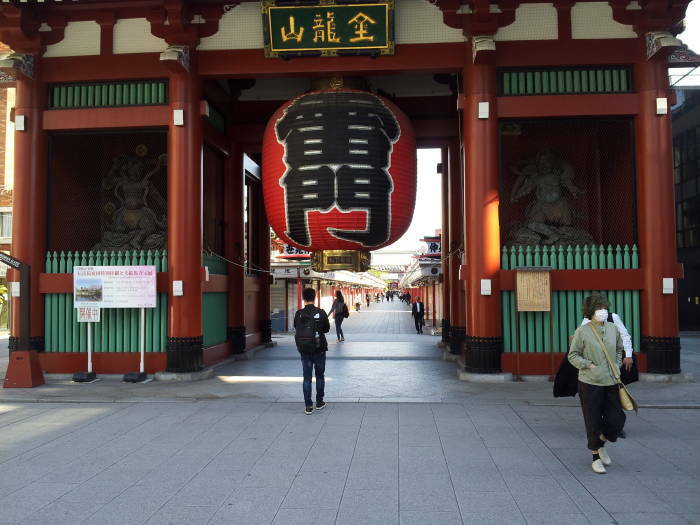 This is the outermost gate leading into the Sensō-ji complex. 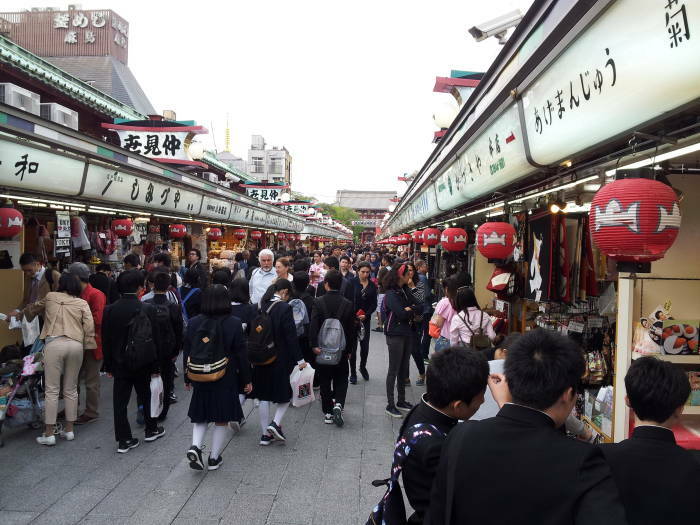 Kamanarimon-dōri is a large street leading from a bridge over the Sumida ride, past the gate, and on to the west. Yes, -dōri means "street". Feel free to use spaces and dashes or not to represent the name of this road in Romanji. It's early in the morning and very quiet, because I just arrived the day before from Chicago. Fly out of Chicago about noon, fly for about 12 hours, and land at Tōkyō Haneda about noon local time. 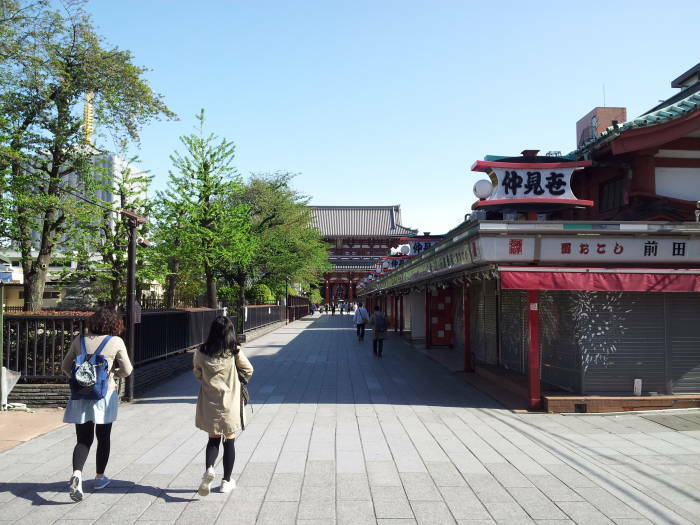 I managed to stay (mostly) awake until about 2100, then I was up and about in plenty of time for a shower, exploration of the neighborhood, and then the 0630 chants at Sensō-ji. A gate or mon marks a passage into a more sacred space. Niō or guardian figures, also known as Shukongō-shin, stand in alcoves to either side. The front side of the gate, the exterior face, is flanked by Shintō deities. Fūjin, the god of wind, on your right or to the east, and Raijin, the god on thunder, on your left or to the west. On the interior face are the Buddhist deities Tenryū on the east, and Kinryū on the west. The Kaminari-mon is a little unusual in having Shintō deities prominently guarding the outermost gate of a major Buddhist temple. 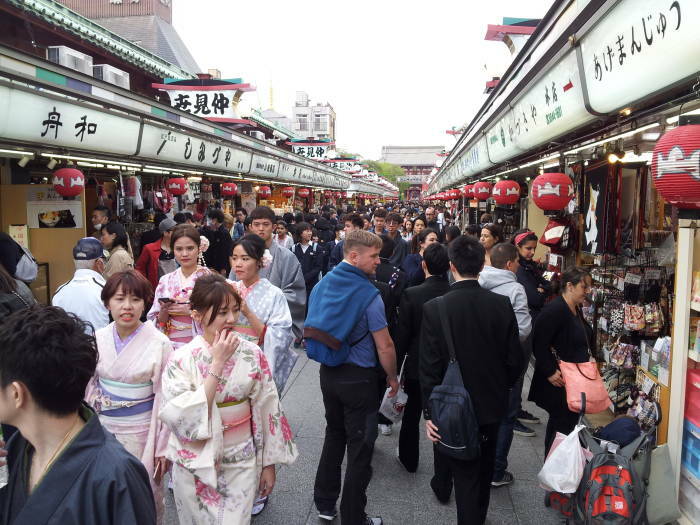 But this is Japan where most things are rather syncretic. The Niō are Hindu deities who have been incorporated as protectors against evil spirits. Their fierce appearance keeps demons and thieves out of the temple grounds. Typically, the deity's mouth on the left is open, pronouncing the sound of the Sanskrit letter अ or A, while the deity on the right has a closed mouth, pronouncing the sound of the Sanskrit latter म or MA. Together they pronounce the sacred syllable Aum or ॐ.
Aum is the sacred sound of Hinduism. But it is used as a mantra in Buddhist, Jain, and Sikh practice. 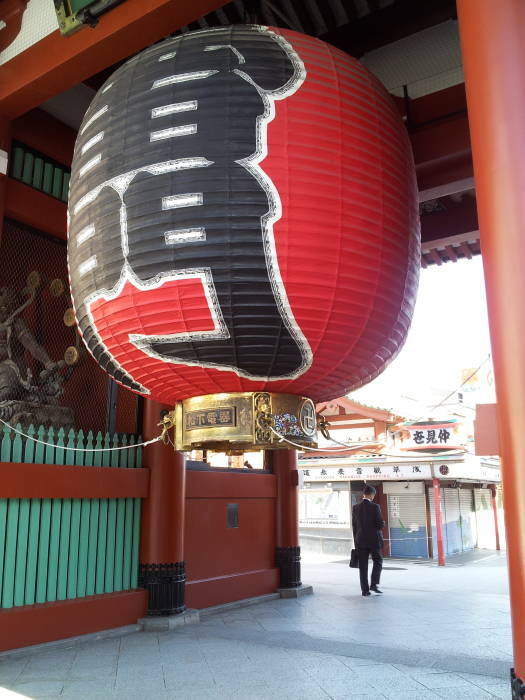 The chōchin or lantern is four meters tall. It is made of paper, and so it is a restoration untold times over. The founder of the Matsushita Electric Industrial Company, now known as Panasonic, donated the original. The Kaminari-mon was originally built in 941, although in a different location. Pagodas are the worst. They're tall wooden structures with metal spires, often built on high points, with no concept until recently of lightning suppression or fire prevention. One thing I learned in Japan is that Buddhist temples (and Shintō shrines) embody the transience of existence. And, that's part of their point. All temples and shrines are regularly rebuilt. Merit is gained by contributing material or labor. Periodic rebuilding is much more significant than the static existence of a temple or shrine structure. The Kaminari-mon was reconstructed here, a new location, in 1635. Four years later, it burned down. The Shōgun Tokugawa Iemitsu rebuilt it in 1649, along with several other structures in the Sensō-ji complex. It was again destroyed by fire in 1757 and 1865. Yes, the U.S. firebombing raids of March 1945 caused destruction in Tōkyō that exceeded that of the atomic bombing of Hiroshima and Nagasaki in some ways. But those were just more rounds in an endless cycle of construction and destruction. There was no gate here during World War II, it hadn't yet been rebuilt after the 1865 fire. The transient structure you see today was built in 1960. A gate belongs here, but not necessarily this specific structure. 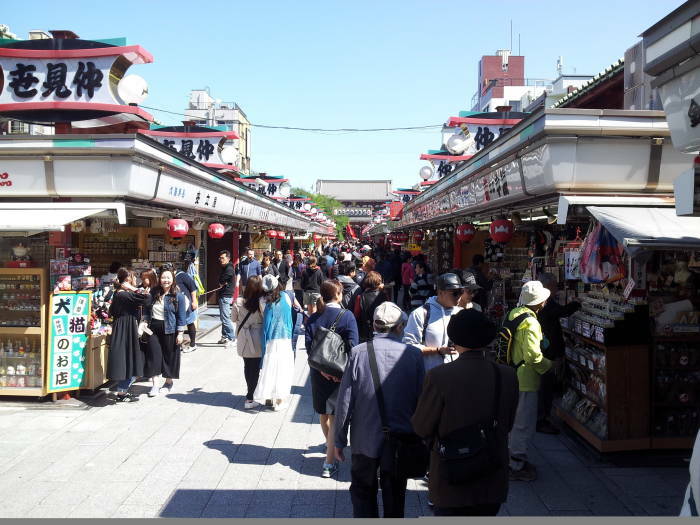 Nakamise-dōri or Nakamise Street is the approach from the outer gate to the second gate, leading toward the temple. 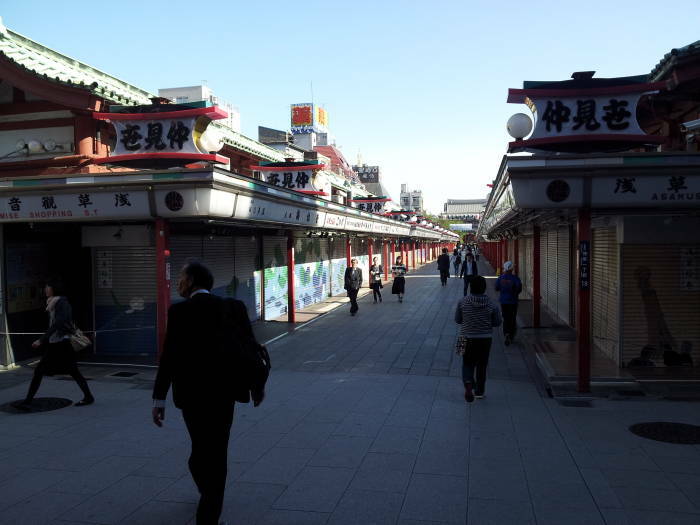 The current version of this street, about 250 meters long and containing almost 90 shops, was rebuilt in 1925. Early in the morning, the shops are closed and the street is quiet. 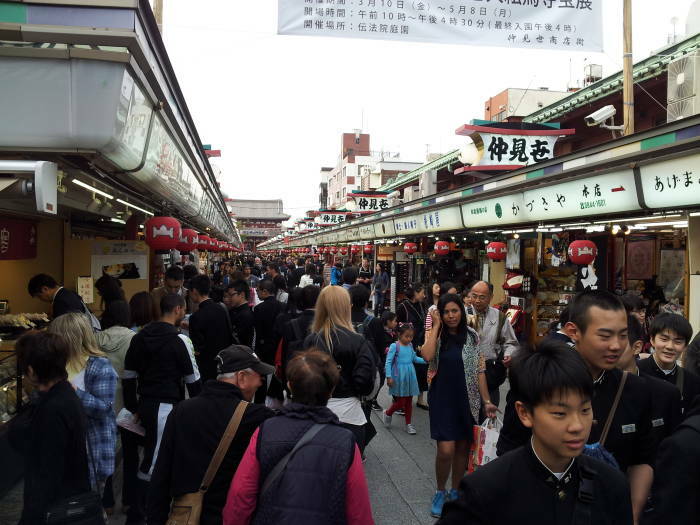 By 0900 to 0930, the shops are open and the street is getting busy. 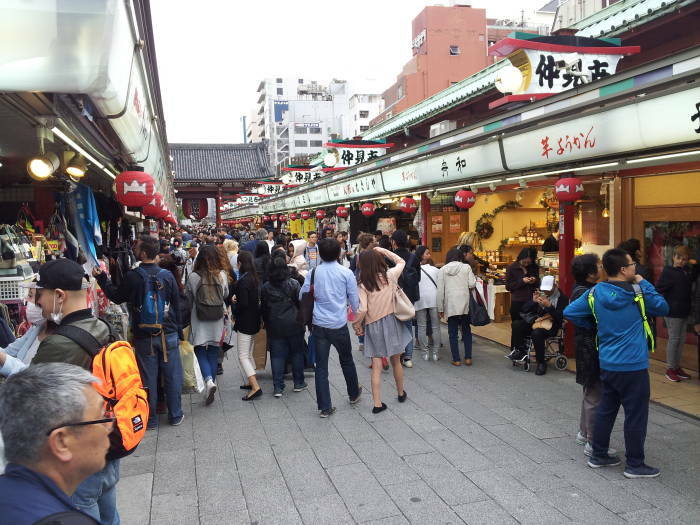 By late afternoon, the street is even more busy. Nakamise-dōri leads us to Hōzō-mon, the Inner Gate, our next stop.